Michel Houellebecq’s books include Whatever, The Elementary Particles, Lanzarote, and Platform, among others. He is the winner of the Prix Novembre in France and the International IMPAC Dublin Literary Award. His novel La Tentation d’une île will be published in France by Fayard in August 2005. He lives in Ireland. Stephen King was born in 1947. He has written more than thirty books, of which there are over 300 million copies in print. In 2003, the National Book Foundation honored King with a Lifetime Achievement Award. Dorna Khazeni is a translator and an interpreter of French and Farsi. She also works as a writer and film programmer. She lives in Los Angeles. H.P. 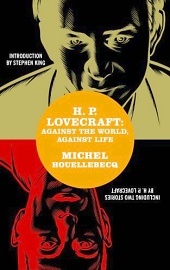 Lovecraft: Against the World, Against Life. By Michel Houellebecq, translated from the French by Dorna Khazeni, with an introduction by Stephen King. San Francisco, CA: Believer Books; 1 May 2005; ISBN 1932416188 (softcover); 247 pages. This book may be purchased in softcover from Amazon.com or Barnes & Noble or directly from the publisher, Believer Books.